Haidt analyzes each political side to show we need the insights of liberals, conservatives, and libertarians to flourish as a nation. 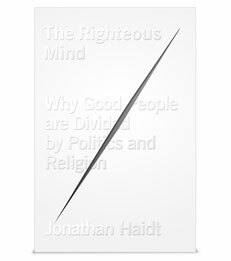 In The Righteous Mind: Why Good People Are Divided by Politics and Religion (Pantheon, March 13, 2012), Professor Jonathan Haidt walks through the world of morality and politics. He explores why our political leaders cannot seem to work together and points the way forward to mutual understanding. Professor Haidt first looks at moral intuition, or self-evident truths, which lead people to believe that those who see things differently are wrong. Combining his own research with that of psychologists, anthropologists and historians, Haidt draws a map of the moral domain and demonstrates why conservatives can navigate the map more skillfully than liberals. Haidt then examines the origins of morality and argues that people are innately altruistic and are fundamentally “groupish.” Finally, Haidt analyzes each political side to show we need the insights of liberals, conservatives, and libertarians to flourish as a nation.